The cat has been long out of the bag for some time, especially when the majority of Sprint’s upcoming devices were unveiled during CTIA 2011, but now they’re all being corralled together on Sprint’s special landing page. Placed together on their “All. Together. Now” page, the HTC EVO 3D, EVO View 4G, Kyocera Echo, and Google Nexus S 4G are now being showcased for anyone to see. Specifically, you can read up on all of their specs and special features, and even more, they’ve got 360 degree models to give you a meticulous look at the devices from all angles. From the looks of it all, these four devices are going to be the ones to drive Sprint’s business for the good majority of the year. So if you really want to get up close and personal with any of these device, you’d better point your web browser to the web site to experience them for yourself. In any event, which device are you looking forward to the most? 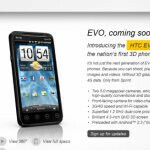 Depending on when the EVO 3D is actually available for purchase, I might make the move to Sprint from VZW. My 1 year contract on the Droid X is up in July, and since VZW has decided to no longer do 1 year contracts, there isn't much to keep me at VZW. Ha! Good one. Maybe I would have to change to ex-Droid_X_Doug? Love Evo 3D. Waiting for the GSM version announcement. Peed laughing... best line of the month!!! !